As Singapore shifts towards computing as a subject for O Levels (high school equivalent), it shows how serious it is about speaking and writing code in the era of the Smart Nation. But how about the working adults? Are we being left out? It is especially stressful for a late 30s, middle-aged, non-geek like me, who thinks coding is like a complicated chunk of jargon on the screen that looks like my five-year-child randomly pressed on the keyboard. But to my pleasant surprise, age is not a factor when it comes to learning to code. To allay my fears and be inspired to pick up coding, I asked three people with no prior programming skills to share their journeys on how they did it mid-career, and who have not only adapted, but also flourished, in their newfound careers. Elisha Tan graduated in Psychology from the National University of Singapore. In her last year, she was exposed to entrepreneurship in Singapore, Silicon Valley and Beijing. That got her thinking about starting a tech startup of her own one day. She shares about what prompted her to learn coding. I decided to learn how to code to build a product myself. “Almost immediately upon graduation, I was accepted into the Singapore chapter of the Founder Institute. After graduating from that program, I was awarded a startup grant under the now-defunct Youth Entrepreneurship Scheme. With the grant and knowledge I gained from the Founder Institute, I sought for a tech co-founder, but I couldn’t find one. I felt I had what it takes to start up, except that I couldn’t code. Tracey Yuen graduated in mass communications before going on to teach and do a post-graduate diploma in Education at the National Institute of Education. While he did not receive formal training in computing, he describes himself a tinkerer and engineer at heart. He elaborates, “I’ve always been a hands-on person, dabbling in photography and taking videos. I was in the United States when I was around 8-9 years old, and was doing some woodworking projects in school. I had taken a watch apart before, and played with electronic hobby kits. It was when he stumbled upon the IDA Labs at Jurong via the Singapore Maker movement, that he took his first step to start coding. “IDA Labs allowed you to tinker with the kits there and learn about the Raspberry Pi and Arduino,” he said, “As I had heard that STEM learning was something the education ministry was placing increasing importance in, it dawned upon me that I could marry my interest in technology with the educational goals of Singapore. I got a chance to learn about Scratch and Arduino through a facilitator training with Mendaki, where we would be assistant trainers for outreach programs. Joelle Yeo, a Bachelor of Commerce graduate, attributes her curiosity in understanding data from her Economics and Finance major in helping her pick up data analytics along the way. She explains, “In the final year of my undergrad studies, I did a short research on factors that would cause couples to cheat on each other. During the process, I had to collect a large amount of information before modelling the data. The process was tedious, as I had to ensure that documents are in the right format before integrating it into a system called Eviews for modelling. It was then that I realised the importance of programming, and how it can be used to automate the process and make things more efficient. I was also intrigued by the amount of information that can be collected from loyalty cards used in the supermarkets in Australia. Tracey was hesitant to learn coding because of his prior negative experience with learning Visual Basic programming in college. To him, using Scratch was a better experience. “Since Scratch uses visual code blocks and plain English, I could get into the mechanics of programming right away,” he said, “and not have to first remember how to write the appropriate commands unique to the programming language. For Joelle, she picked Python, which is a language often used for data analytics. “When I first started learning Python, I found it challenging, as it was very structured,” she said. “Every code had to be thought in a logical and structure manner. One thing I didn’t expect was how supportive and nice the Ruby community is. Elisha took the very Singaporean way for learning new skills – tuition. “Since he is a Rubyist, I learned Ruby on Rails from him. Learning a programming language can be quite a steep curve, but it’s manageable once you get the hang of it. Elisha did not just enjoy coding, she took it to another level. 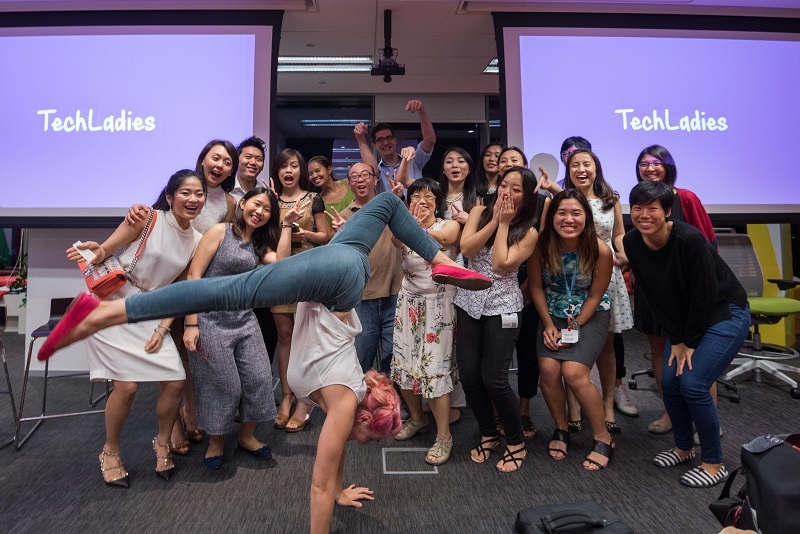 Combined with her entrepreneurial skills, she founded Techladies, a community for women in Asia to connect, learn and advance as programmers in the tech industry. She proudly declares that women are no less coders than men, and is on a mission to get as many ladies to learn coding as she can. She has instructors like Jaryl Sim, Michael Cheng and many others, who have come forward to provide their expertise and experience. Joelle is an analytics consultant in Ernst and Young pursuing her passion for data analytics. She specialises in providing implementation of data analytics solutions, designing visualization dashboards and improving business processes through developing analytic models. For Tracey, his love for teaching did not stop, except now he could teach something that he loves to do. He is currently an instructor at Thinkertanker, where they teach coding and electronics. “Never stop trying,” Joelle advises. Software is eating the world, and it is more important now than ever to be code literate. “There are free coding websites such as Codeacademy and DataCamp which provide step-by-step guides on how to code. I would also recommend downloading Notepad++ when writing code, as the codes are colour coded and formatted depending on the type of scripts that you are using. Elisha believes that one should act instead of just thinking about it. If you understood my code, I hope this will ignite your interest in coding. And from the stories shared by Joelle, Elisha and Tracey, may you be inspired to take a course in coding today! This article is the eleventh of the ‘Engineering Singapore’ Series, where I delve into the state of engineering and its community in Singapore.